I was born in Hastings in 1965 and have lived in the town all of my life. Over the years, I’ve witnessed many changes about the town. I remember the demolition of the war memorial in the town centre, the redevelopment of Castle Street and, latterly of course, the closure of the cricket ground (I was at the last ever match) and the building of the Priory Meadow shopping centre. In fact, growing up here I eventually came around to thinking that there were just three things about the town that would (nor seemingly could) ever change. One was the castle with its prominent position on top of the west hill, another was the pier as the town’s majestic figurehead and the other was Jack and Sonia London’s ‘The Record Shop’ on the corner of Stone Street, halfway up Queen’s rd. There was always something completely timeless about ‘The Record Shop’. It was there when as a kid at school I was into Glam rock in the 70’s, there when I became a DJ into soul and disco in the 80’s and there when I finally ‘hung up my headphones’ in 2001 because the modern music was no longer ‘my scene’. Not only was the door to the shop always ‘guarded’ by a life sized ‘Guide Dogs For The Blind’ collection box in the shape of a Black Labrador but, once inside, owner Jack would invariably be wearing one of his ‘very comfortable’ (but distinctly 1950’s ish!) button-up jumpers and similarly smart but dated spectacles! In fact, as the years went by, going into the shop began to feel more and more like visiting a living museum as the shop still had it’s original ‘listening booth’, many of the original RCA and HMV advertising boards and (seemingly at least) the same selection of vinyl records in the racks. I always used to wonder how Jack and ‘Son’ (whom, if not there already, was always going to be “coming down later” according to Jack, used to make enough money to keep going with the stuff they sold, but I was jolly glad that they did never the less. Jack London (named after the famous boxer of around the period) was born in Camden Town, London on the 2nd of August 1930 to parents William and Lily. William, a merchant seaman for many years, was now a publican (his father had also run a pub in Clacton) and Jack was born in ‘The Wolsey’, the family pub. In some ways, Jack was lucky to ever be born at all as his fathers ships had been torpedoed three times during the 1914-18 war. Tragically however, in spite of ‘outwitting the gerries’ bombs those three occasions in 1936 Jack lost his father at the age of 5. The running of ‘The Wolsey’ soon proved too much for mum Lily and the life that Jack may well have ‘fallen into’ fell apart. Then, with the threat of war once again on the horizon, Lily and Jack moved to stay with Jacks Auntie Florrie and Uncle Jim at 441 Battle Road Hollington. This house also turned out to be a kind of sanctuary for a lot of Jacks London cousins and one such cousin, Iris has fond memories of the 9 year old Jack strumming an imaginary guitar and singing songs like ‘South Of The Border’ and ‘Deep In The Heart Of Texas’ to her there. Jack first attended Bal Edmund school run by Dorothy Cat until mum Lily found a herself a job at a grocery shop and managed to get a place of her own in Bohemia. From there he went to Tower Rd School where Taffy Evans was the headmaster. Despite passing his scholarship for the Grammar School however, Jack left school at age 14 to begin his working life. In that same year (1944) Jack got a job at Attwells And Binfield, a music shop situated at no 15 Grand Parade, along Hastings Seafront. Attwells sold pianos, transistor radios and of course 78’s. In 1948, Jack was called up for National Service and spent 18 months as an M.O’s clerk in the medical section of the RAF. On returning to ‘civvy street’ Jack worked for a few months for John Bristow at Hole Farm, Westfield Lane before returning once again to Attwells. It was during this second stint at Attwells, that Jack was ‘head hunted’ by local businessman Peter Wilkins who had recently opened a record shop called Peter Wilkins Ltd in Queens Road, Hastings. Evidently, while an excellent businessman, Wilkins (and his business partner Michael Tenbosch) did not have a great knowledge of music or the record trade and thus thought that Jack, with all his experience and (even then) extensive knowledge, was just the man they required to manage and run the shop. Jack took the job and ‘Peter Wilkins Ltd’ soon became known locally as ‘The Record Shop’. The shop was situated on the other side of Queens road but almost opposite the site of the shop of the same name that Jack and Sonia would eventually be famous for. In fact, it was while working in the shop that Jack first met his wife Sonia. A dental nurse, Sonia ordered the sheet music for ‘Snow White’ from the shop but it turned out to be rather elusive to obtain. With her repeated visits to see if it had arrived, Jack got to know Sonia quite well until when eventually, it arrived he asked her to come out on a date with a friend with him and one of his pals. Sonia of course said yes and for a while her, Jack and their friends went out regularly as a foursome. Things developed between Jack and Sonia and they soon started courting in earnest until eventually getting married on Saturday September the 8th 1956. Such were the times however, Jack and Sonia had to cut short their honeymoon because Wilkins would not give Jack a second Saturday off work. With the shop now doing well, Wilkins and Tenbosch bought another property in a slightly better position on the other side of Queens rd and so they moved there. Due to his success and growing reputation in the town, it was not very long until Jack was offered a seemingly better opportunity working for Scott Douglas at a shop called ‘Silverhill Radio’ (which rather bizarrely sold washing machines, transistor radios and records). This time however, things didn’t work out so well for Jack and ‘Silverhill Radio’ hit hard times and they let Jack go. Ironically, it was ‘Silverhill Radio’ that went on to become Stylus Records where I myself worked in the early to mid 80’s. It was after Jacks job finished at ‘Silverhill Radio’ that Jack and wife Sonia decided to go into business for themselves. They began negotiating terms with the owner of the corner of Stone Street shop in 1962. With everything in place, Jack and Sonia built the counters and painted up the inside of their shop sometimes even working until late in the evening Jack having whitewashed the windows for privacy. Finally, on the 31st of January 1963 ‘The Record Shop’ we all knew and loved (and miss terribly!) opened its doors for the very first time. Jack stocked records, sheet music and radios, but what really helped him build up his new business was his decision to pioneer the sale of Hi-Fi equipment in the town. 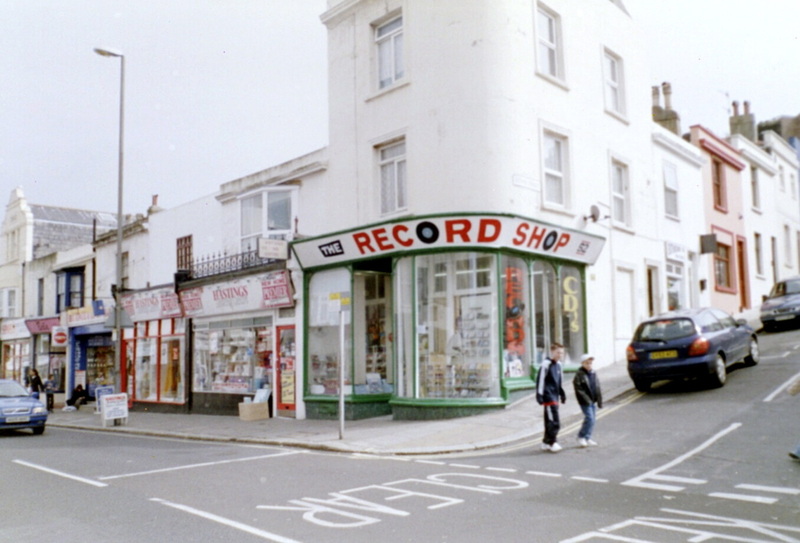 In fact, ‘The Record Shop’ was the first place in Hastings to do so. Jack and Sonia also became members of the ‘Recorded Music Circle’ and ‘Tape Recording Clubs’ in the 1950’s and from there I suppose the rest is history. For the next 44 years until their final day of business on the 25th of November 2007, Jack and Sonia would take just one holiday: - a ‘long weekend’ to London so Jack could visit his fathers grave and show his ‘Son’ where he was born in Camden Town. Jack London passed away peacefully in his sleep in bed next to his beloved Sonia on the 20th of June 2007. With their cat lying on the end of the bed it was a suitably warm and comfortable setting for Jack to draw his last breath. Those two words, warm and comfortable, sum up the London’s for me and I feel I can confidently say that none that have ever been touched by Jack, Sonia and their ‘timeless magic’ will ever forget ‘The Record Shop’. After all, who could EVER forget Sonia’s Christmas window displays, Jacks jovial and helpful manner or all the times you had to ask to use the shops outside loo down the back stairs after drinking one too many of those cups of tea! Dedicated with much love and thanks to Jack and Sonia London. (Nov 30, 2013) Mark Bartlett said:Since moving away from Hastings (1981 - 2001 Perth Rd) to live in Scotland, there isn't a day that goes by that i don't think about my home town. I'm not alone when I look back at where I used to live and feel emotional - just check the 1066 forums for comments from people who have emigrated overseas for that. So what is it that gives rise to this strong affection for Hastings? I don't know... but Jack so obviously DID! RIP Sir. (Aug 28, 2013) Jim Breeds said:By the way, I still have all my records, starting with "She Loves You", my first ever purchase in Jack's shop. Some of my LPs have my name written on the back in Jack's own hand from when I used to pre-order and he would put it aside for when I could get into town to collect it. He never asked me for pre-payment either. (Aug 28, 2013) Jim Breeds said:Lovely piece Antony. I bought my first records from Jack in this shop. USed it so many times over the years until I moved away from Hastings in 1979. What a lovely couple they were. So pleased to have found this page. Thanks. (Apr 15, 2013) Roger Hewett said:Yes, a wonderful account of the couples life. In the 1960's I would buy my records from either the Disc Jockey or The Rec.Shop - Though I was just a pimply shy teenager the pair would be very friendly and spend time helping me with any disc enquiries. I moved away from Hastings in the 1970's and on a visit in 2006 [approx] I was overjoyed to find the shop still there, and, inside found the couple chatting to someone. As I browsed I told them I used to shop there and remembered them, they very very interested [they of course didn't recall me] but as we chatted Sonia offered me a cup of tea! It was for me all quite touching and I left with warm feelings, and if truth be told, a lump in my throat. the passing of Jack, or the shop. Am I right in thinking that Sonia is still with us ? I wish her well. (Feb 25, 2013) Robert Newman said:Fabulous story. I remember the shop so well as a child growing up in Hastings, just opposite on the other side of Queens Road was The Fab Boutique owned and run by Brian Fisher and his wife..... a store that sold the latest fashions in clothing. (Jan 13, 2013) Steve Bartlett said:Great memories of Jack & the much loved, greatly missed shop. I always used to call in whenever I was in Hastings. Jack loved Be-bop & Modern Jazz, which was and still is my first love. We used to talk for ages.....Happy Days! at Jacks shop in the 1970s when collecting singles and albums . And what a fantastic knowledge the man had. Happy days ! (May 14, 2015) I moved to hastings in 1973, when i was 15 spent every saturday in that shop! Jack was a lovely man. Comment: Jill Lawrence. (May 14, 2015)I lived in Hastings until 1995. I remember Jack London very well. My father was a good friend and customer of the shop. and I later bought many of my prog rock albums there in the 70's. As others have said, nothing was too much trouble. ( Jan 8, 2015) A great piece on the well known and well loved Record Shop. I went into the shop many times to purchase the 'latest' single with my hard earned pocket money. Comment: Vic Whitelaw. Name Tony May Comment: Overjoyed to see that so many people have enjoyed my piece on Jack and Sonia. I would imagine the proceeds of Jack's Glenn Miller collection would have gone to charity. When I was interviewing Sonia for this article she told me that she was selling off some of the shop items for that purpose - mind you this was to do with unsold stock and fittings etc - she was not one to part with personal things lightly, I don't think.